Commonwealth youth delegates aged 18 to 29 met for the 9th Commonwealth Youth Parliament (9th CYP) from 25 February to 1 March 2018, hosted by the Commonwealth Parliamentary Association (CPA) and the Jersey States Assembly in St Helier, Jersey. The 49 delegates at the 9th CYP came from fifteen countries, ranging from the largest (India) to the smallest (Niue), and from 35 CPA Branches* across eight CPA Regions. The five days of the Commonwealth Youth Parliament provided a key development opportunity for young people from the Commonwealth with ambitions of public office and introduced these potential young Parliamentarians to the fundamentals behind the processes of Parliament. Youth delegate, Elsie Harry (St Kitts and Nevis) said: “From taking part in this Commonwealth Youth Parliament, I've learnt that the challenges that different regions face are specifically related to their geographical situation and historical context and within the Commonwealth we always have to bear this in mind when making decisions.” Talha Haroon (Pakistan) said: “The biggest thing that we can take from this Commonwealth Youth Parliament is what we have learnt from each other. We all come from diverse places across the Commonwealth yet we can each take home new experiences and a shared understanding of tolerance, acceptance and working with each other that will help us in our future lives.” Pierre de Garis (Guernsey) said: “You can’t ignore the fact that this Commonwealth Youth Parliament which brings together such a diverse group of people with different cultures and histories had challenges. However it is testament to the Commonwealth that the demonstrable values we all share have allowed us to come together and find consensus and common ground.” At the closing of the 9th CYP, the Chief Minister of Jersey, Senator Ian Gorst said: “To be a leader is an honour and to lead is to serve. The Commonwealth brings together people for global and local benefit. I am extremely proud of our young people at the Commonwealth Youth Parliament and I have an overwhelming sense that our future is bright and can be successful.” In addressing the 9th CYP delegates at the start of their programme, the Secretary-General of the Commonwealth Parliamentary Association (CPA), Mr Akbar Khan, said: “Together, this week we are a fantastically diverse group serving as a microcosm of Commonwealth youth. Please learn from each other, network and seize the opportunity to forge lasting friendships. I encourage you to pursue your ambitions, political or otherwise.” At the end of the 9th CYP, he observed, “Mission accomplished.” Please click here to read his full opening address. Mr Mark Egan, Greffier of the States Assembly added: “We were delighted to welcome so many young people from across the Commonwealth to Jersey for this exciting and unique opportunity. The Commonwealth Youth Parliament gives young people the opportunity to develop their leadership skills and experience our historic Parliament, as well as empowers them to make a positive difference in shaping the future of their own communities.” The CYP gave participants a Pan-Commonwealth experience and a hugely valuable networking opportunity including with current young Members of Parliament from the Commonwealth - Hon. Temard Butterfield, MHA (Turks and Caicos); Deputy Sam Mezec (Jersey); Hon. Jermaine Figueria, MP (Guyana); Hon. John Paul Mwirigi, MP (Kenya) - who acted as mentors throughout the week. 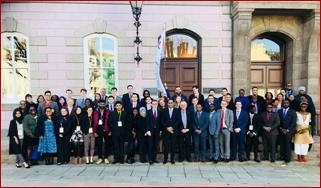 In a notable departure from previous years, the 9th CYP, in recognition of the non-party system in the States Assembly in Jersey, saw youth participants acting as the Government, Opposition and independents sitting together, allowing for a wider sharing of opinions and engagement in debates. Participants experienced parliament in a real-life situation in the legislative chamber. The programme also included taking part in parliamentary procedures, debating legislation and motions in relation to the fictional ‘Commonwealthland’. Many of the sessions were presided over by CPA Jersey Chairperson, Connetable Len Norman from the States Assembly of Jersey and the States Assembly staff ensured the smooth running of parliamentary procedures. The CYP delegates also faced the media in a ‘mock’ press conference with questions from local journalists including Andy Sibcy of the Jersey Evening Post and Clare Burton from ITV Channel Islands News. Delegates at the CYP9 were entertained at a dinner hosted by Highlands College, a leading Further Education College in Jersey, with chef and hospitality students and lecturers providing the excellent food and service. A new ceremonial mace for the Commonwealth Youth Parliament (CYP) was inaugurated at the 9th CYP in Jersey. The mace was presented to the Commonwealth Youth Parliament by the delegate from British Colombia, Canada on behalf of the former Speaker of the Legislative Assembly of British Columbia, Hon. Linda Reid, MLA, who hosted the 8th CYP in 2016. The CYP ceremonial mace has been handed on to the Parliament of India (Lok Sabha) on behalf of the CPA India Region as the future hosts of the 10th CYP. The 9th CYP was originally to have been hosted by the House of Assembly of the British Virgin Islands in October 2017, but that was made impossible by the devastating effects of hurricanes Irma and Maria.